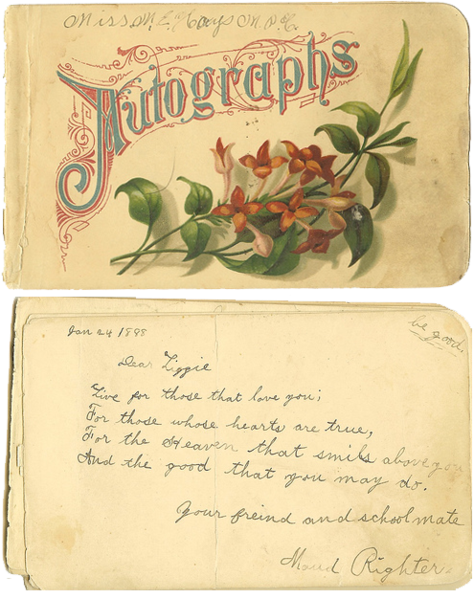 Do you remember autograph books? Some kids nowadays haven't heard of them, and that's a shame. If you're looking for a cute and quick literacy idea that involves your kids in both reading and writing, suggest autograph books to them. We LOVED our autograph books. I still have mine from when I was about ten. Our goal was to collect signatures from the people in our lives. Some people concentrated on collecting autographs from celebrities, but somehow I didn't seem to meet many of them. My friends made up the bulk of my book. They signed their names, but also wrote rhymes and quotes that we thought were profound or hilarious. What a good swimmer Susan would be. The powers of heaven were shaken. I'll be last in this book. I'm sure that you ain't. Your kids might like to create their own themed autograph books. They could go for the vintage look as in the picture above, circa 1888 (no, it's not mine!). You can get some neat ideas on vintage at Etsy or on BeAFunMum blog. They might cut out pages in the shape of something they're keen on, like a car, and bind the pages to create an auto autograph book. Or they could add bling and colour according to their heart's desire, and find quotes about or from fairy princesses. Did you have an autograph book? Do your kids have one? Please share a quote in comments so we can compare witticisms! I had one (well, several) ... now I'm off to find them! One page I remember: the standard 'Roses are red, violets are blue, sugar is sweet and so are you.' from a sweet friend. Under it, another friend had written 'roses are red, violets are blue, most poems rhyme, but this one doesn't.' We thought it was absolutely HILARIOUS. Ho ho ho. Oh to be 11 again. Well, I thought it was pretty funny. I sometimes wonder if I have a bad case of arrested development! Thanks for plumbing your childhood memories for us - not that you have to go back very far. Put them together and remember little me. I loved my autograph book! And yes, I probably still have it more than 40 years later. The funny thing is I see my grandkids saying some of the same kinds of things to each other on their social networks. The question is whether these electronic versions will still accessible years from now. I hope not too. One thing this post made me do was pull my autograph book out, and remember people I hadn't thought of in years. It's a lovely souvenir of childhood at the very least. I suspect not Chris. Thanks for making that point. I don't have an autograph book from my childhood but they look like they would be great fun for students! They really are fun, Kelly, and a nice way to sneak a little literacy into kids' lives! Thanks for putting me in here! I loved my autograph book. Thank you for the memory. Hmmm, where is that book??? If you don't find your old book, I can just picture you making a new one that has a vintage or retro look anyway, Kelly B! 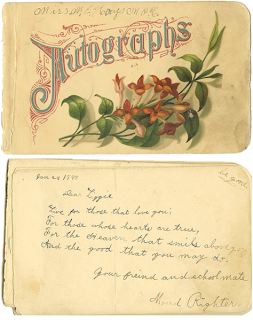 I have a autograph book from 1890s to 1930. I found in my granmas belongings, not sure what to do with it, some of the writing is fading its very brittle cos of the age. Thrs sum great poems in it. I dnt wnt it to get any more damage, dose any1 no the best way to store the book to stop damage.